Strawberry Trifle. Photo credit: Susan Jones. Did anyone else hear the summer trifle story that was featured on NPR’s “All Things Considered” this week? 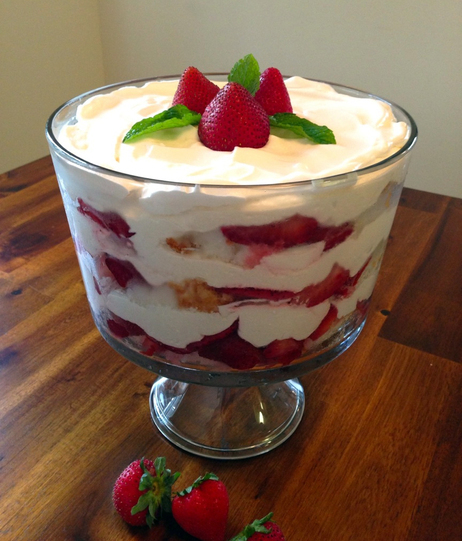 As part of their Taste of Summer recipe contest, they asked readers to submit their favorite “found recipes” and Indiana resident Susan Jones submitted this recipe for strawberry trifle, which she found on a country walk one day. (Presumably someone had thrown out lots of recipes and this was among the stack). It turned out to be a winning recipe for Jones. One look at the recipe would make any Brit shudder. It’s a completely Americanized version of trifle, made with – horror of horrors! – Cool Whip and cream cheese. And having said that, I should add that I haven’t made it, but I can also nearly guarantee that it is absolutely delicious. Cool Whip + strawberries + angel food cake = an instant winner, no matter how you cut it. Blasphemous but true! Mix cream cheese and powdered sugar until creamy. Add whipped cream and vanilla. Cut angel food cake into small squares. Slice all but 3 or 4 strawberries. Gently mix sliced berries in bowl with 1/4 cup sugar; let sit for 15 minutes. Cover the bottom of a large trifle dish (clear, stemmed bowl) with a layer of the cake squares. Follow with a layer of cream cheese mixture, then strawberries. Alternate, ending with the cream cheese mixture on top. Garnish with reserved whole strawberries and mint leaves. Refrigerate for an hour before serving. Posted on 26, July 2013, in Food and tagged All Things Considered, British, cooking, desserts, NPR, radio, recipe, Strawberry Trifle, summer, Taste of Summer. Bookmark the permalink. 4 Comments. *shudder* unless you named it something else and then I’d happily munch on it next time in over!! Yes, I can see the good in coming up with a different name for something like this!